Total private residential construction spending increased to a seasonally adjusted annual rate of $378.5 billion according to the latest Census estimates. The current reading is a slight increase of 0.1% from the revised March estimate and 17.2% higher than one year ago. Single-family spending increased by 1.3% month-over-month while the home improvement category decreased by 2.2%. Multifamily spending posted another strong month-over-month increase of 2.7% from the revised March estimate. The figures show significant improvements in residential construction spending for all categories from the prior year. 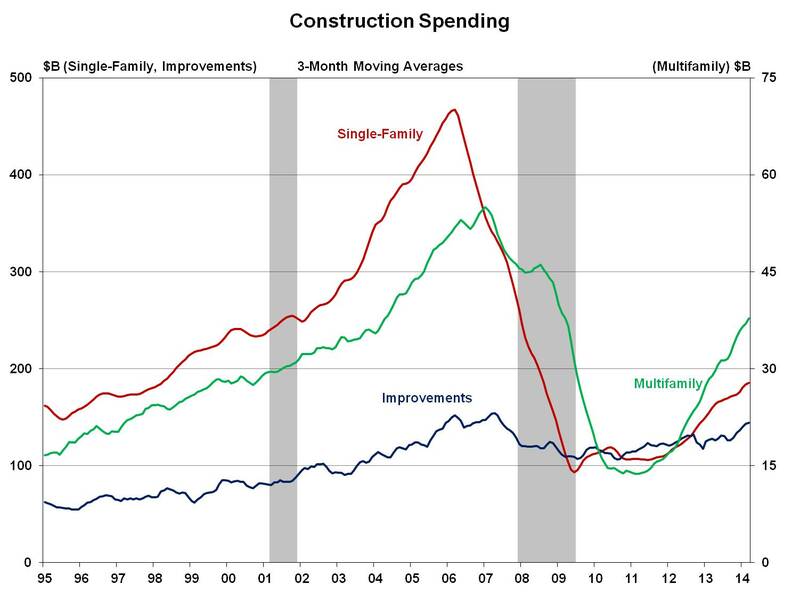 From April 2013, on a 3-month moving average basis, construction spending in single-family increased by 14.6%, multifamily increased by 32.2%, and remodeling increased by 18.5%. The growth in multifamily construction spending appears to match builder and developer sentiment about current conditions in the apartment and condominium market. The NAHB Multifamily Production Index (MPI) increased three points to 53 in the first quarter of 2014. The index and all of its components are scaled so that any number over 50 indicates that more respondents report conditions are improving than report conditions are getting worse. The MPI aligns with NAHB’s expectation of a 6 percent increase in multifamily starts this year. Residential construction spending posted a small increase in March but was effectively unchanged over the beginning of 2014. The total value of private residential construction put-in-place increased to a seasonally adjusted annual rate of $369.8 billion according to the latest Census estimates. The current reading is an increase of 0.8% from the revised February estimate of $367 billion but is 16% higher than one year ago. Month-over-month single-family spending increased by 0.2% and the home improvement category increased by 0.6%. 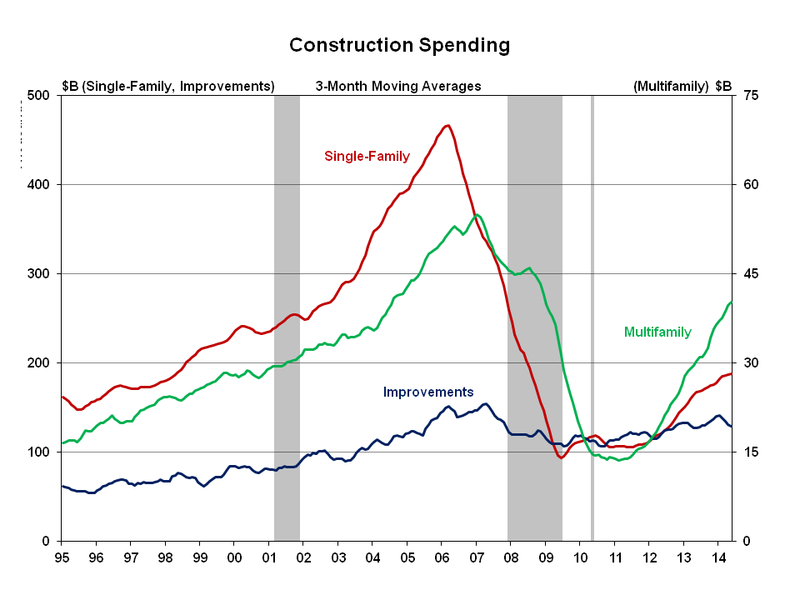 Multifamily construction was up with a relatively stronger month-over-month increase of 4.4%. The figures show significant improvements in residential construction spending for all categories from the prior year. 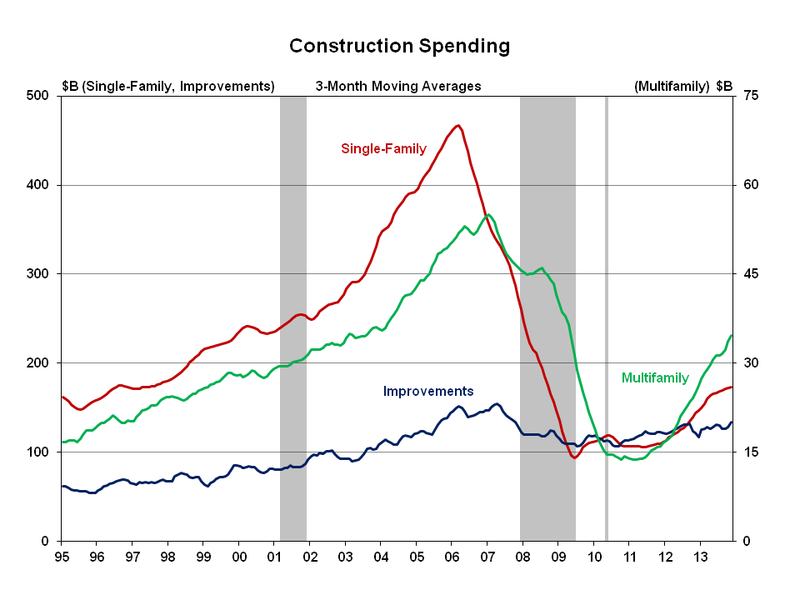 From March 2013, on a 3-month average basis, construction spending for single-family increased by 16.3%, multifamily increased by 30.8%, and remodeling increased by 12.8%. According to Census estimates, total private residential construction spending increased to a seasonally adjusted annual rate of $359.9 billion during January. The current reading is an increase of 1.1% from the revised December estimate and 14.6% higher than one year ago. 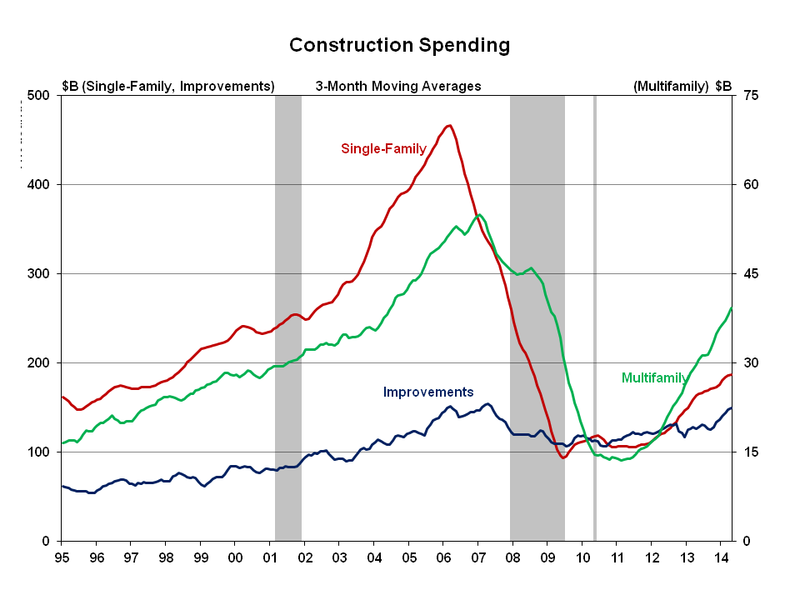 Total private residential construction spending increased for the third consecutive month. Single-family spending registered an increase of 2.3% for the month, while the multifamily category saw an increase of 1.0%. The home improvement category saw a slight decrease of 0.4% for the month. The figures are well below their respective peaks but the data shows significant improvements in residential construction spending for all categories from the recent lows and the prior year. From January 2013, on a 3-month moving average basis, single-family spending increased by 20.6%, multifamily increased by 31.7%, and remodeling increased 9.4%. Total private residential construction spending increased in December for the second consecutive month to a seasonally adjusted annual rate of $352.6 billion according to Census estimates. The current reading is a 2.6% increase above the revised November figures and 18.3% higher than one year ago. Single-family spending registered a healthy increase of 3.4% for the month, while the multifamily category saw a more modest increase of 0.5%. The home improvement category saw an increase of nearly 2.0% for the month. Spending in all categories continued to experience significant improvements from December of last year. On a 3-month moving average basis, single-family construction spending increased by 20.0%, multifamily increased by 34.5%, and remodeling increased by 14.0%. Although spending continues to improve for all categories, it remains well below their respective peaks. Since market low points, total private residential construction spending is up 54.3%, single-family 99.4%, multifamily 172.5%, and improvement-related spending 29.7%. The data show significant improvements in residential construction spending for all categories from the prior month and last year. The year-over-year increase in multi-family construction spending was large (34.5%) and is reflective of developers moving to meet an increase in the demand rental units. Rental vacancy is currently at a 12 year low. Total private residential construction rebounded in November after a slight drop in October. According to Census estimates, total private residential construction spending increased to a seasonally adjusted annual rate of $345.5 billion in November. The current reading is a 1.3% increase from the revised October estimate and 16.6% higher than a year ago. Single-family spending registered an increase of 1.8% for the month, while the multifamily category saw an increase of 0.9%. The home improvement category saw a healthy increase of 2.2% for the month. From the start of 2013, on a 3-month moving average basis, single-family spending increased 15.1%, multifamily spending increased 26.6%, and remodeling increased 7.1%. Since market low points, total private residential construction spending is up 51.2%, single-family 91.7%, multifamily 169.5%, and improvement-related spending 30.0%. The figures are well below their respective peaks but the data show an improvement from October estimates and significant improvements in residential construction spending for all categories from the prior year. In fact, the Census Bureau’s latest release shows that the seasonally adjusted number of homes under construction has now increased for 27 months in a row.